This 6.0 x 6.0m Garden Room with Veranda has been installed in our customer’s large garden, overlooking a lake in Spilsby, Lincolnshire. 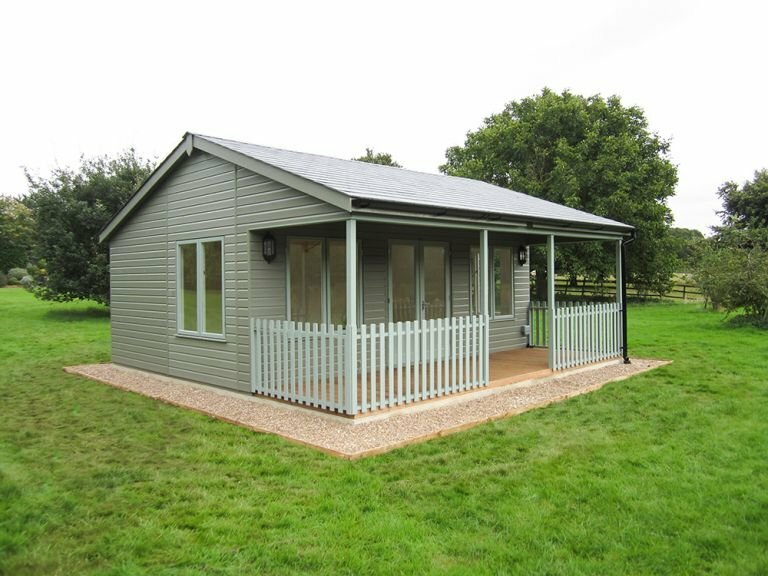 This lovely garden building will become an entertainment focal point for the family to use all through the year. To allow the Garden Room to blend in with the surrounding greenery of grass and trees, the customer chose to have it painted in two natural colours from our Valtti paint range: Ash for the walls, and Sage for the windows, doors and veranda. The sheltered veranda is 1.8m deep, making a lovely place to sit outside in the summer for a perfect view of the lake. Grey slate effect tiles, plain windows, and black guttering with a downpipe to finish off the external look, and the inside is fully suited to year-round use. 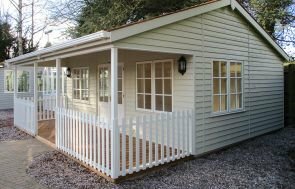 Inside as standard, our Garden Rooms come with full insulation, double glazing, painted matchboard lining, draught excluders in the doors and windows, a Natural lacquer on the floor, and an electric pack with a heater, making it perfectly suited to use, no matter what time of year it is. This customer also chose to have an extra heater for extra heat, and two Velux® windows in the roof for extra light. 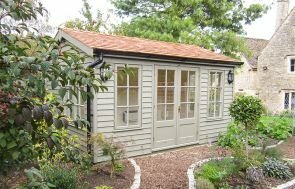 To learn more about our Garden Rooms, Studios and Summerhouses, please send us an online enquiry,or create your own bespoke garden building using our online price builder. Alternatively, come and visit our Norfolk Show Centre to speak to our knowledgeable team.